If you’re wondering what we thought of Gen Con, while we weren’t there, we were following the news very closely, and posted our top 3 news items from Gen Con on our Facebook feed during the week. While the number of announcements and new releases did seem to be down from last year, there was still plenty to get excited about. One thing that did stand out for me though, was a lack of any announcements about upcoming app-integrated, or digital games. Although controversial (needlessly) there is no doubting that app-integration got off to a very successful start with X-Com, Alchemists and Golem Arcana being well-received critically, and, to the best of my knowledge, selling very well too. The board game industry is as much at the mercy of trends as any other, and so I expected there to be a ‘second-wave’ of digital-integration, with more designers folding the tool into their collection, and publishers jumping on the bandwagon. I was excited to see where digital-integration would take the hobby next. It’s exactly the kind of mechanic that could leave to some real innovation, and I would hate to see its battery fade before it had a chance to even fully charge (sorry). Maybe it’s just too soon, though, and it will take a little longer for the second wave to hit. Board games are not designed, playtested and produced over days and weeks, but rather months, and often longer. So if the next wave takes a little longer, fingers crossed it will lead to innovation rather than novelty, and some genuinely great new games and mechanics. Fingers crossed that some digital surprises will be unveiled at Essen later in the year. I missed that! How did I miss Dead of Winter news! That does sound like a great idea, and will presumably provide scope for a quick, digital expansion as well. I gotta go read more! 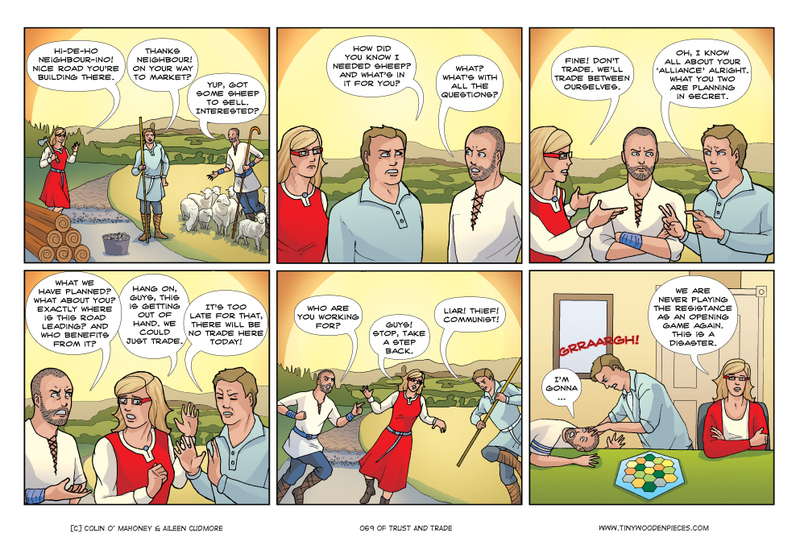 I thought that’s how games of Catan went anyway. Catan isn’t a game we play much with my group of friends, in fact I can’t remember the last time we did. But it’s one we always take with us when the family gets together because it’s one of the few games my sister will play. She’s not a big fan of boardgames but she loves Settlers. That’s a big part of the reason why I still value Settlers so much; it’s easier to get my family to play this than most, and for that reason, it will always have a place in my collection, and I’m glad of it.